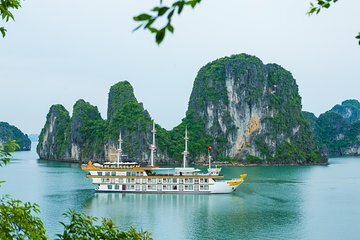 Cruise Halong Bay to Bai Tu Long Bay, and journey to off-the-beaten-path places on this 2-day cruise from Hanoi. Set sail from Hon Gai International harbor, and stop at a white-sand beach in the Vung Dang-Cong Dam area. Visit Thien Canh Son Cave and Yen Duc agricultural village, plus, see a water puppet show, too. This cruise visits attractions not always included on overnight tours, such as Bai Tu Long Bay. This tour on a large boat/junk the Dragon Legend 2 from Hano was very well organized: pick up at our hotel in old Hanoi was on time and we were driven in a very comfortable van - for 6 passengers only - in 4.5 h to Halong where we boarded the boat for a 24h tour of Halong bay, before being driven back to Hanoi. The boat was large enough to accommodate 40-plus tourists without us feeling squeezed, on the contrary. There are lots of space plus there is a small pool and a large sundeck where we could practice TaiChi in the morning of the 2nd day before breakfast. Food was also very good for the 2 lunches and dinner. We had a nice kayaking experience to see the sunset from a small beach as well as a stop to visit a beautiful cave. Last but not least of the positive points: the team was very welcoming and helpful. The bad point we had was our room! It was on the 2nd floor just above the engines at the aft of the boat and very noisy and shaky during the day when the boat is cruising, while at night, even though the main boat engines were stopped, we could still hear well the engine on the other boat supplying electricity to our main boat. After we complained, they moved the 2nd boat so that we could spend the night in quietness. This issue does not happen with the other rooms which are far enough from the aft and engines, so beware when booking! The trip was perfect! The pickup at our Hanoi hotel was right on time and the van was new and very nice. The ship was beautiful and the crew members were exceptionally gracious, accommodating, and competent. The food was fabulous! Halong Bay is truly one of the most magical places I have ever seen. I would highly recommend this trip!!! The boat was absolutely stunning, and the room really spacious and luxurious. Food was plentiful and delicious - there was nothing provided that we weren't happy to eat. There were a couple of times when a choice of activities had been indicated, and when it came to it there was no choice - but we were very happy to do the activities which were happening, so this was not a problem for us. We were very well taken care of. The bed and rooms were comfy, the food was tasty, and the junk was the nicest of all the ships we saw. The attentive staff made our time enjoyable and easy. Halong Bay is not to be missed. One of our favorite parts of our trip to Vietnam.